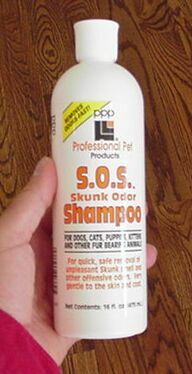 PRODUCT DESCRIPTION: Pet shampoo which will chemically react with skunk scent to deactivate the odor. 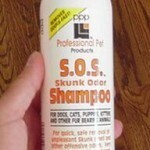 Skunk scent is comprised mainly of thiols which is a very acid and not water soluble material. Because of their nature, the scent does not wash off and tends to linger. Our shampoo works by oxidizing the sulfur atoms of the thiols which changes them to compounds which don't smell and which are more water soluble. This enables the scent to be washed off better but regardless of what is left behind, it won't smell. RATE OF APPLICATION: A pint is enough to shampoo a small to medium dog twice which are dogs up to 50 lbs. Large dogs will probably require the entire pint to be used for a good treatment. If the animal is over 100 lbs, you may need more than one pint to treat it effectively. Dogs with extra long hair will require more material as well. Try to get enough for at least two treatments to insure you remove the smell completely.